Join the hustle and bustle at Adelaide’s famous Central Market as you explore and discover the unusual, the exotic and the bizarre as layer by layer the charm and character of the Market are peeled away for your absolute enjoyment. Your guided Central Market tour will take you on a walking journey of discovery. Just for ‘starters’ you will visit a selection of fresh produce stalls uncovering an assortment of irresistible fresh produce and gourmet foods, along with native and exotic delights reflecting Adelaide’s vibrant multicultural influences and passion for fresh foods. You’ll also meet stall holders and share their knowledge as you get to sample their array of fresh produce. Be prepared for a few surprises tucked away on this amazing introductory tour of Adelaide’s favorite icon, the Adelaide Market. This is a really interesting drive into Australia’s countryside. After leaving the city you very quickly arrive into the famous Barossa & Clare Valley Wine District and even more quickly into the true countryside of Australia that you have heard about. The Flinders Ranges make an awesome backdrop to farm lands that soon disappear into true Outback Australia with your final destination oasis of Arkaba Station. The Flinders Ranges are one of Australia’s most ancient landscapes, molded by hundreds of millions of years of geological activity, and also home to some of the most spectacular outback scenery in the country. Arkaba is a 60,000 acre wildlife conservancy, its craggy sandstone bluffs and dry creek beds lined with River Red Gums are a quintessential Australian scene, while the geological amphitheater of Wilpena Pound lies on the northern boundary of the property. The rest of your day is at your leisure to enjoy the surrounding at this unique Australian property. Today you are at leisure to enjoy the activities at Arkaba or relax in the natural setting. You also have the option of including a day trip into the neighboring Flinders Ranges National Park. This day tour includes a drive through the likes of Brachina and Bunyeroo Gorges or a visit to the old mining town of Blinman and lunch at an outback pub hotel – a great way to explore some of the local surroundings! Experience Australia’s countryside as you journey through the true Outback and the amazing Flinders Ranges before arriving into the relative civilization of the Clare & Barossa Valley wine district. Your next two nights will be spend at The Louise. With just fifteen suites, each with private terraces, soft contemporary furnishings and spacious en suites, the romance of an idyllic vineyard hideaway is complete. Acclaimed on-site restaurant Appellation, offers seasonal cuisine nightly for casually elegant dining. One hour from Adelaide, The Louise is one of Australia’s premier vineyard retreats. 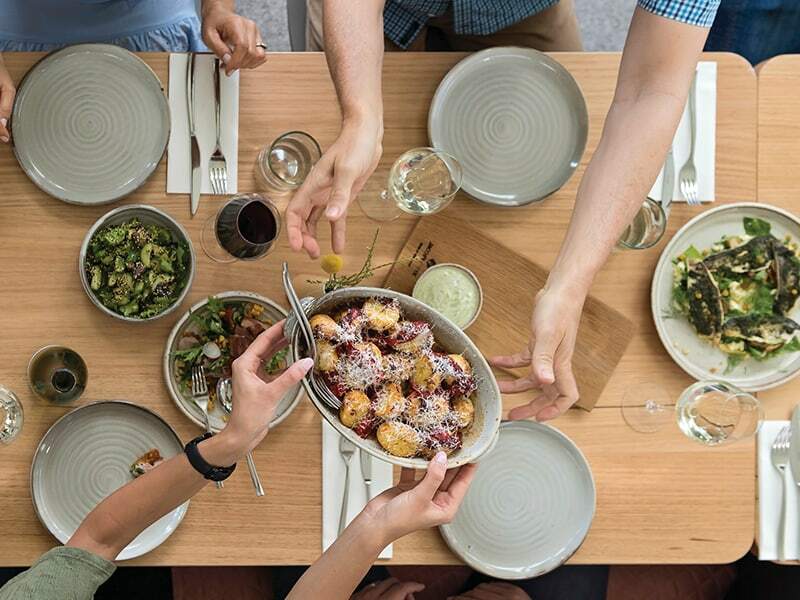 It’s no secret that most visitors to South Australia’s Barossa Valley have come for a world-class food and wine experience. The global reputation of the Barossa’s iconic wines is undisputed, and fine dining venues such as Appellation, provide guests access to fresh local cuisine paired with the region’s outstanding wines. Lesser known, the Barossa is home to a large conservation park abundant with native Australian flora and fauna. The Louise has developed a unique experience that offers guests access to one of the simple pleasures of visiting regional Australia, seeing kangaroos up close in their natural habitat. As Australia’s third largest island, Kangaroo Island is just 100 miles long by 35 miles wide. The Island boasts outstanding natural beauty and its relative isolation since European settlement has ensured an abundance of wildlife in a stunning and protected natural environment. With 21 national and conservation parks covering more than 30 per cent of the Island’s total area, Kangaroo Island has established itself as a premiere destination for nature lovers of all types. Southern Ocean Lodge provides a level of style and sophistication on Kangaroo Island. Set in natural bush land overlooking a spectacular section of coastline, the organic luxury of the contemporary Lodge will ensure guests have every opportunity to relax and explore the Island’s wonders with a dash of indulgence. Located at Hanson Bay on the Island’s south west coast, the Lodge site adjoins both Flinders Chase and Cape Bouguer/Kelly Hill National Parks. Set back from a cliff above the pounding surf the sensitive design showcases a full frontal panorama and is within easy reach of all of Kangaroo Island’s major attractions. Its location, stunning views, contemporary environmental design, locally sourced food and beverages, personalized interpretative activities and modern wellness spa will ensure its status as a South Australian icon. Southern Ocean Lodge offers guests a complete Kangaroo Island experience. With selected guided island experiences, all guests enjoy a personalized experiential touring itinerary of the Island’s unique natural attractions. A range of signature activities are offered daily allowing guests to encounter rich and varied wildlife, indulge in world-class food and wine and discover the Island’s unique natural attractions, often with exclusive access and always with a touch of luxe. Rates include Signature Lodge Experiences. A menu of Bespoke Experiences provides further opportunity for exploration and excellent private charters are also available at additional cost. Wonders of Kangaroo Island is a half day experience, and a spectacular introduction to the Island’s wildlife, maritime heritage and stunning coastal landscapes. The Coastal Clifftop Walk is a scenic walk starting on the Lodge’s doorstep atop the limestone cliffs of Hanson Bay. Kangaroos & Kanapés. Soak up the history of the early island settlers at Grassdale, an historic island property reached by a short drive from the Lodge and where local wildlife including kangaroos and wallabies congregate to graze.